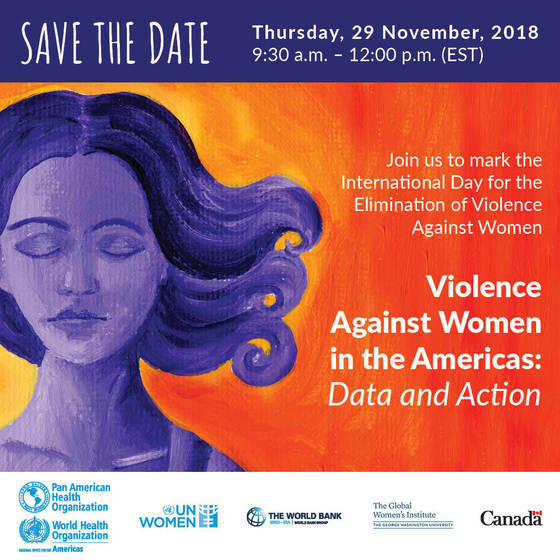 To mark the International Day for the Elimination of Violence Against Women, the Pan American Health Organization (PAHO / WHO) will hold the event "Violence against women in the Americas: Data and Action". This event takes place on Thursday, November 29, and is organized in collaboration with the World Bank, the Global Women's Institute of the George Washington University, the Permanent Representative of Canada to the Organization of American States (OAS) and UN Women Caribbean. New data on the prevalence of intimate partner violence in the region of the Americas will be shared as we discuss what actions are necessary to end violence against women by reviewing recent experiences in Canada and in Nicaragua. Join GWI, Pan-American Health Organization (PAHO), UN Women, The World Bank, and Global Affairs Canada for an event to mark the International Day for the Elimination of Violence Against Women. This event will focus on new evidence from the Americas around what it takes to bring down levels of violence.